There are 334 chimpanzees in Japan (April 2010). However, there are no bonobos at all. KUPRI in the collaboration with GARI (Hayashibara Great Ape Research Institute, directed by Dr. Gen Idani) decided to start the joint endeavor of studying bonobos both in the wild and in the laboratory. The new department, named "Department of Bonobo Research (funded by Hayashibara group)" starts in April 1st 2010. It has a plan to introduce 5 bonobos to Japan in the collaboration with AZA species survival project in near future. The new department consists of the following three faculty members: Testuro Matsuzawa (professor, double appointment), Satoshi Hirata (Visiting associate professor), and Shinya Yamamoto (assistant professor). 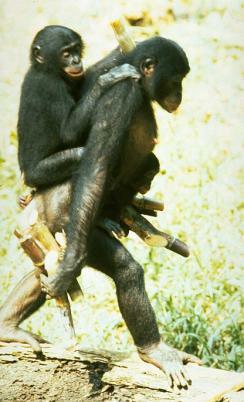 KUPRI has the long tradition of the bonobo research. The former professor Takayoshi Kano is the first person who started the field study of wild bonobos in Wamba, ex-Zaire. He did his first extensive survey in 1973, and he settled in Wamba in 1974. His achievement is known as his book titled "The last ape". The tradition is succeeded by the faculty members of Department of Ecology and Social Behavior such as Profs. Takeshi Furuichi and Chie Hashimoto. The new department aims to enforce the existing tradition and also provides the complementary approach to study their cognitive functions in the laboratory. 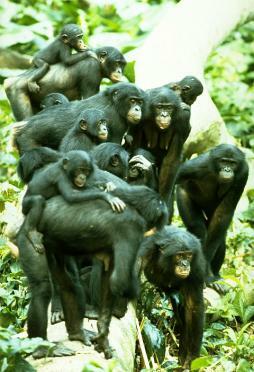 By synthesizing the fieldwork and the laboratory work we may know more about bonobos and also about the evolutionary origins of human nature.